This is the start of a beautiful rib basket. This frame comes unassembled but is easy to assemble. 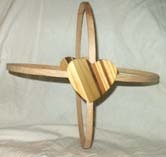 The wood parquet hearts take the place of the god's eye and is an easy start to a rib style basket, either a melon or egg basket. Each parquet is hand made, no two alike! Very unique new idea!